FlossieBlossoms: Nosey Parker is officially FAMOUS! I participated in another swap recently. The challenge was to make a mini quilt between 6" x 6" up to 12" x 12", using only black, white and one other color. Look what came in my mail today- it's Nosey Parker, in a mini quilt! As I'm sure you can imagine, I just love this! A lady named Marilyn, she goes by Spiced Coffee over at Flickr, made this for me. 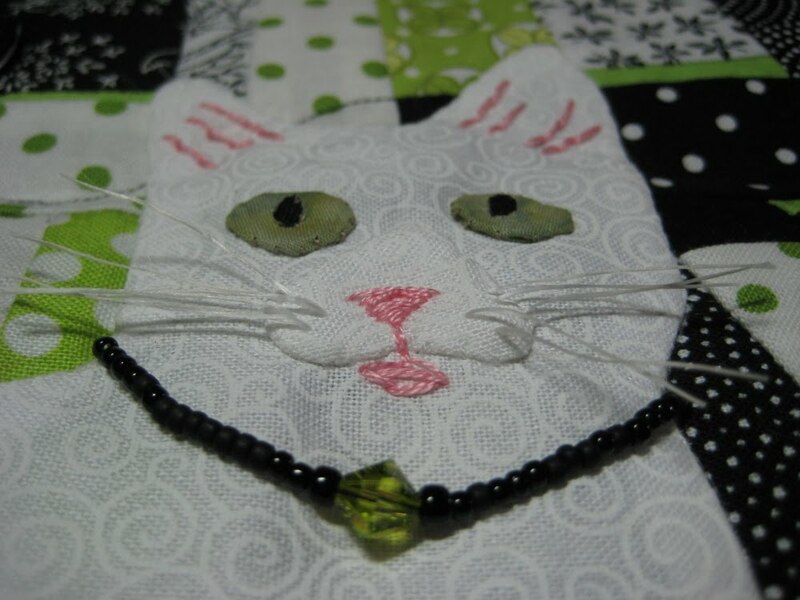 It's so delightful, there's a little 3D butterfly near her ear, a beaded necklace/collar with a green crystal on it, tiny whiskers, beautiful green eyes, and lovely pieced work in a liberated fashion, it's spectacular! All the great black and white and green fabrics are just perfect and put together so well, Marilyn has a real eye and quite the reputation as a fabric or textile artist. She intimidated me quite nicely! I was just thrilled beyond words, it's so precious! My baby, in fabric, for forever. This is so cool. I quick put it up on the wall to keep someone from walking across it and getting those beautiful whites dirty! You can see the size here, I think. I wanted you to be able to see the sweet face, the "chop" piece just cracks me up, it's so lifelike in person, those round little whisker pads, I love them! This is the cutest thing ever and I will treasure it always, thanks so much, Marilyn! Marilyn likes crows and magpies so I made this for her. 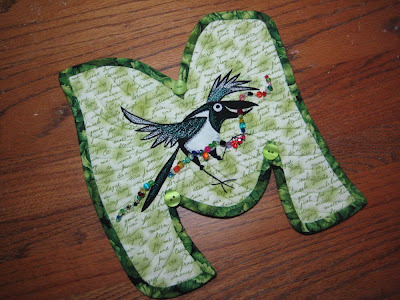 "M" is for Magpie. Neither of us knew that we had each picked green to be our "other color", but we both have green craft rooms, isn't that funny? And we both love nature, cats, birds, bees, etc. And we are both cheaters. She opted to leave her quilt rectangular because it suited the quilt the best (fine by me!) 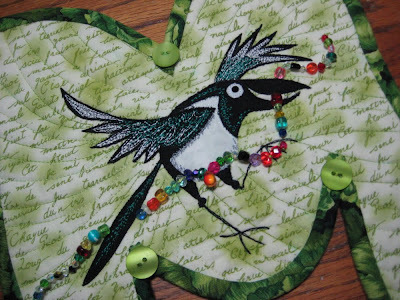 and I cheated by adding a string of colored beads to the quilt to give it some color and because it suited the sneaky nature of a thieving magpie. I learned something, too. I learned that I don't know the proper way to bind a sharp inside corner like at the bottom of the M or at the top, where it dips tightly. Good golly, that was tricky and I ended up putting those pretty buttons there to help disguise imperfections. If anyone knows the "real" way to do it, will you please share that with me? Thanks! that is quite a quilt. Both of you should be so proud of your FUN and wonderful quilts! Way to go girls! THey are both beautiful! Nosey just looks right too! What a lovely quilts! I did a quilt once with sharp interior corners, and I had a hell of a time binding them. I love the buttons! Awesome, awesome, awesome! you have gotten some fabulous quilts in the last couple swaps!!! 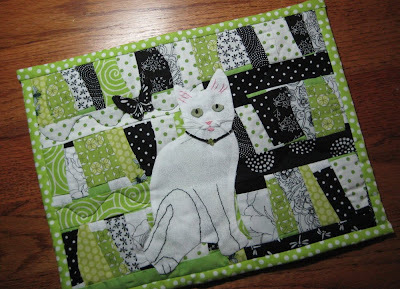 the cat quilt is outstanding! both quilts are wonderful, but oooh, I love that little Nosey Parker! that angled photo was excellent to see the detail - love those whiskers! Oh my gosh! Both of these are fabulous. Little works of art. You have really outdone yourself with those wonderful swaps! A great way of making treasures for others and of course receiving treasures for yourself! I'm go glad to see little NP on the wall, she is (as you have said) truly famous now!! 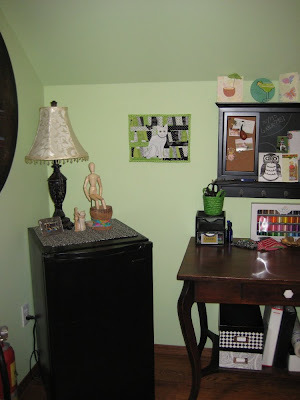 It's so much fun to see our little black, white and green quilts here in your blog! This was one of the most fun swaps ever, and I'm so lucky to have gotten you for a partner! Oh my gosh, both of you ladies made wonderful little quilts! How great that Nosey Parker is now preserved in a quilt forever and not just because her DNA is embedded in the fibers LOL. Smart move putting it up on the wall right away so the kitties couldn't "test" it and leave behind some of the aforementioned DNA. That's just marvelous! Nosy in quilt form is almost (but not quite) as adorable as the real thing! I'm new to quilting but I ran across your blog while looking for ticker tape quilting info--your black/rainbow one is just absolutely inspiring to me! I love your blog and your tribute to your cat. What fun it must have been and so very clever. By the way he is a beautiful cat. Wow! it's a wonderful miniquilt!